If you haven’t heard about the Northern Irish #gaycake row, here’s a useful run-down of it. Such timing, emerging in the same week as Ireland’s history-making referendum on marriage equality. The oddest turn that this continuing story has taken? Well, that would be Sesame Street releasing an official statement about Bert and Ernie’s relationship. Amazing. 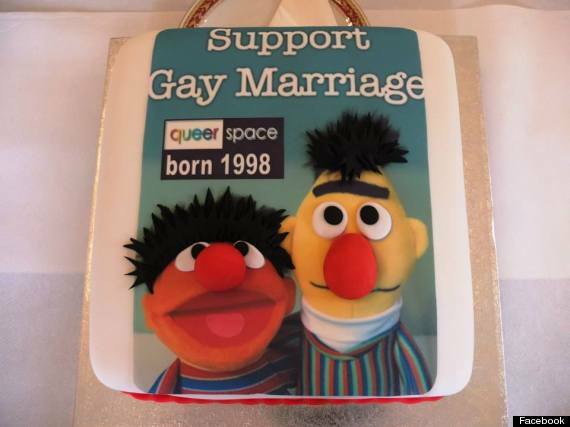 And Bert and Ernie are just puppet pals (although Bert is definitely looking a little dreamy-eyed on that cake, with his arm round Ernie, justsayin’). One more thing though: if, as Sesame Street would have us believe, puppets do not have a sexual orientation – WHERE DO MUPPET BABIES COME FROM?